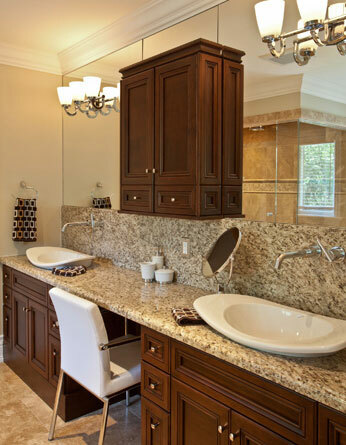 When it comes to designing your kitchen and bathroom one of the most important elements are the countertops. Countertops see a lot of action; in the kitchen they take some abuse from hot pans, chopping knives, and spilled liquids and in the bathroom they are the resting place for hot curling irons, hair dryers, spilled make-up and much more. 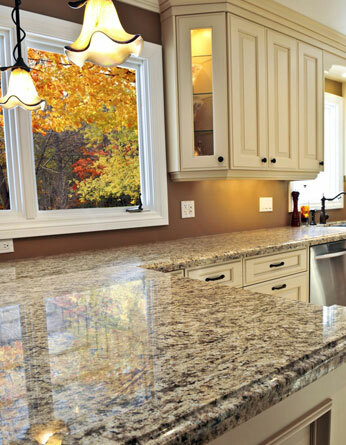 Countertops are functional but they also offer an aesthetic value to every space. They provide the perfect opportunity to enhance the visual appeal of your kitchen and bath. Other design opportunities include backsplashes in kitchens and baths and eye-catching materials for your shower walls and tub surrounds. One general consideration for kitchen planning is to be sure to consider entry doors and what direction they swing. The clear opening of a doorway should be a minimum of 32” wide which requires a 2’10” door. Doors should not interfere with other doors or objects like cabinets or appliances. If space is an issue, consider using a bi-fold door or pocket doors. This is a simple item to plan for, but a costly item to replace if changed after the completion of the project! There are a variety of materials available today for countertops and many times no one material is best for all surfaces. This is especially true from a design perspective; combining different materials in creative applications always makes for a show stopper space! In this section on Countertops and Walls, you learn about the multitude of products available for these surfaces such as ceramic and porcelain tile, natural stone and slab, solid surfacing, Quartz and specialty products including soapstone and paperstone. We will cover everything you need to know before you make a purchase and how to maintain your new countertops to provide lasting durability and beauty. Grout lines- do they bother you? Islands- Do you have or are you planning one?